A rip current overturned the whaleboat with eight Kanaka Christians aboard. Only three of the men could swim, and the others clung to the upturned boat. Sharks circled the three as they struggled to get to shore. The three survived, but the others could not be found. When Florence heard the news, she resolved to go on despite the dangers. Once timid and unsure of her own salvation, New Zealander Florence Young rose to her calling and became a fearless and faithful witness for Jesus Christ. 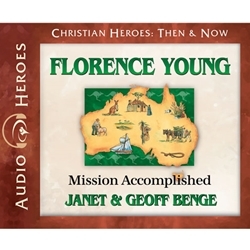 Eventually serving in the remote Solomon Islands and, for a season, in China during the deadly Boxer Rebellion, Florence began her service close to home.